Talk has been going round the Pagan world about rebuilding the cults of the old Gods. My friend Sam Webster has been calling publicly for this as well as in private conversation, a call echoed by Druid writer John Beckett. (It was Sam, by the way, who sat me down two years ago and gave me encouragement to take up the Morrigan’s mandate and begin drawing Her priesthood together, when I was still hesitating. I need to thank him again for that.) P. Sufenas Virius Lupus spoke of bringing back the Gods of the ancients as well. So rebuilding the cults of the Gods; that seems to be what I and fellow priests are engaged in. Rebuilding, restoring, bringing back. This language presupposes continuity with our Gods’ ancient cults – an assumption that we need to be very circumspect about, particularly in the case of Celtic deities, such as the Morrigan, whose cult was never documented by its adherents. Thus I thought it was time for a post examining this question. The historical cultus of the Morrigan: What do we know? It has been said that there is no evidence for Her actual worship – and in the strictest sense this is true. Direct evidence of cult practice specifically linked to the Morrigan, by name, within the lands relevant to the early medieval Irish texts in which She appears, is virtually absent. However, we have a very interesting body of indirect evidence that suggests the outlines of Her cult, and it is from this that we can build a modern cult practice. Notice I say here that we can build, not rebuild. In my work to establish a priesthood and practice of worship, I make no claim to historical reconstruction. I trust if you have the patience for this long post, you will see why. So. What do we know? People have written dissertations on the topic, so I will only attempt to highlight a few core concepts. 1.Where She was worshiped. The name Morrigan arises from Irish sources beginning in the early medieval period and referencing Iron Age culture. While this is sometimes taken to mean that the Morrigan is strictly an Irish deity, there is a substantial body of indirect evidence pointing toward a pan-Celtic presence of a Goddess at least closely resembling Her. In almost every Irish source text speaking of the Morrigan, She is given multiple names and forms; and if we look at these names and forms, we can easily recognize them beyond Ireland. For example, the Morrigan is frequently also referred to as the Badb, or Badb Catha, an epithet which means ‘battle crow’. In the continental territories of Gaul, we have sources which refer to Cathubodua, a Gaulish name which is exactly cognate to Badb Catha. In addition, if we look at the meaning of the name Morrigan, translated as ‘Great Queen’, we also find references throughout the Celtic world to Goddesses of this title, occurring in virtually every Celtic language branch. While ‘Great Queen’ may have been a title applied to multiple different Goddesses (such as may be the case with the Welsh Rhiannon), in many cases it appears in context with attributes that do indicate a battle Goddess and/or one taking the form of a scavenger bird. Since there is compelling evidence for continuity of other deities between Irish, Brythonic, and Gallic lands (for example, Lugh/Lleu/Lugus), I think it’s safe to conclude that we have a pan-Celtic Goddess in the Morrigan, though naturally the forms of worship must have varied geographically and over time. 2. Seasonal worship. We know that there was a broadly pan-Celtic bi-seasonal calendar in effect which, at the very least, recognized major transition times at dates corresponding roughly to Samhain and Beltaine. Within the Irish context, we have a substantial literature documenting the importance of Samhain itself as a feast time associated with kingship and the sovereignty of the land, as well as battle, Otherworldly encounters, sexual rites, and epiphanies of the Morrigan Herself. Many of Her appearances in literature occur at Samhain; but also, folklore still exists throughout both Ireland and Britain of the Morrigan or Her cognate figures emerging from the land at Samhain. As we know that great tribal gatherings did take place at Samhain in many Celtic civilizations, it is not too far a stretch to suggest that seasonal devotions may have taken place at these times, and in particular to the Morrigan since She is closely linked to the season in lore. 3. Incidental/temporal worship. Beyond seasonal rites, there are suggestions that devotional practice may have taken place on an incidental basis – that is, in connection with particular historical events. We know for example, that in Gaul, temporary war shrines were set up in connection with battles taking place in historical moments. Remnants of these temporary war shrines have been found, showing the placement of enclosures, the contents of offerings that were made, and corresponding to a discrete time horizon that bears the hallmarks of warfare – mass graves and other evidence of slaughter, captured arms and materials, etc. – and then deliberately closed down soon after. None of these shrines carry the name ‘Morrigan’ on them; however, pictorial evidence has been found that links funerary sites of this kind with carrion-birds. And we also know that at least one of the specific deities linked to warfare and warriors, and taking the form of the carrion crow, was Cathubodua, our Badb Catha, or Morrigan. Many other kinds of incidental devotional practice probably existed. We know of Celtic leaders and Druid priests in the ancient world making sacrifices and taking omens on many kinds of occasions – at moments of tribal importance such as kingmakings and royal weddings; before important battles (such as the omen-taking of Queen Boudicca before her final battle with the Romans); and many other kinds of occasions. We can presume that if the Morrigan did have a historical cult of worship, She probably would have received devotions on occasions such as these – and in particular those related to sovereignty, battle, and funeral occasions. If we look at forms of devotion known to be practiced by the Celts in general, however, we can fill out the picture a little more. We know that throughout many of the Celtic lands, devotional sites often included a hollow altar – essentially, a sacrificial pit into which offerings were deposited, and then eventually the site covered over and a new pit established. Contents of hollow altars vary depending on the site, cultural context, and time, but common to most sites are the bones of animals cooked or burnt, and offered to the Gods. Many sites also included valuables such as armor, weapons, jewelry, tools, and the like. At war sanctuaries such as the ones described above, as well as permanent sites such as Roquepertuse and Gournay-sur-Aronde, we also find evidence of offerings specific to war deities, and including war spoils, captured arms, heads, skulls and bodies of captured foes, as well as horses and other more common offerings. 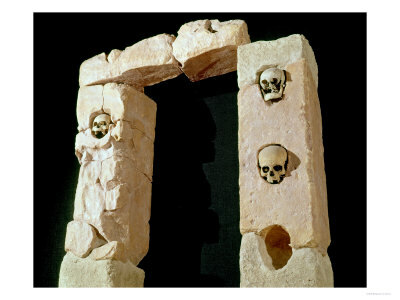 A common feature of these sanctuaries is a highlighted, massive portal in stone (or wood in the case of temporary battle shrines), typically with carved skulls and/or niches for the display of heads and other offerings. At Roquepertuse, the portal is presided over by a large raptor or carrion bird. Other such war sanctuaries have been shown to be associated with funerary practice specific to slain warriors, who appear to have been excarnated (given to carrion birds) as a form of both offering to the war deity in bird form, and of funeral ritual for the dead. This practice was also documented by contemporary Roman and Greek historians, who were appalled at the Celtic practice of excarnation, not understanding that to give the bodies of fallen warriors to the Battle Raven to devour was to sanctify them far above burial or cremation. The practice of human sacrifice to Celtic deities in general is also well documented both by contemporary authors, as well as archaeological remains, throughout Ireland, Britain and the Gaulish continent. Irish cromlechs and stone altars exist, in some of which have been found traces of blood, likely from such offerings. Thus, while we have no documentation of such an altar or sanctuary clearly dedicated by name to the Morrigan, we have a fairly clear picture of cult practice for war deities such as would have been appropriate to Her: shrines to war deities in carrion bird form, in which funerary rites were conducted; stone or hollow altars, at which blood, the bodies of the dead, animal sacrifices, and spoils of war were dedicated as offerings; and these offerings were both elevated for display on the portals and palisades, as well as being deposited in hollow altars. There is naturally much more to the picture. For instance, while cult practices related to Her martial aspects are easier traced than, say, Her role as prophetess and poetess, clues exist which we could examine. And there is the question of Her sovereignty aspect, and whether it can be linked to the Celtic devotional practice of water deposits. But for a blog post, this is about as far as we can go. All of this of course begs the question: Assuming a historical cult of the Battle Raven existed as described, why would we want to rebuild it? Blood-drenched altars, human sacrifice, mass excarnation, spoils of war? How does any of this fit into modern Pagan practice? Answer, of course: It doesn’t. Nobody I know is seriously interested in offering severed human heads to the Morrigan, and if I met someone who did, I wouldn’t invite them to my rituals. We aren’t attempting to rebuild the ancient cult of the Morrigan. We are rather working to bring a new tradition to life which honors Her in a way She hopefully recognizes, but which dignifies our present human values.